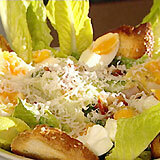 Caesar salad was created in the 1920s by chef, Caesar Cardini, at his restaurant in Tijuana, Mexico. It was apparently put together on the spur of the moment, using leftover ingredients and assembled at the table. Below Alonso's easy version of Cardini's famous recipe. 2. Cut the bread into thin slices and brush with the 2 tablespoons olive oil. Season with salt and pepper and place on a baking tray in the oven for about 15 minutes until crisp and lightly browned. Remove from the oven, place on absorbent paper and rub each slice with a cut garlic clove (but don't throw away the garlic clove, you'll use it later, crushed). 3. Place the bacon slices on a greased baking tray and bake in the oven until dry and crisp (about 10 minutes). 4. Place the 2 eggs in a pan of cold water and bring to the boil. Boil for 90 seconds then halt cooking by running the eggs under cold water. Shell the eggs and cut into quarters. 5. Mash the anchovies with a fork and add the mustard, salt and pepper, grated parmesan, and the remaining garlic, crushed. Put the egg yolk into the bowl and whisk it into the other ingredients. Whisk in the olive oil in a thin stream as if you were making a mayonnaise. Finally, add the vinegar. 6. Arrange half the lettuce leaves in a large salad bowl. Pour over half the dressing, toss thoroughly, and top with croutons, parmesan shavings, egg quarters and the bacon wafers. 7. Arrange the remaining lettuce leaves in the bowl and drizzle the rest of the dressing over the top. If you wish, you can also scatter over some chopped fresh herbs of your choice. Learn appreciation. Be willing to take lovingly each small gift of life, receive it, acknowledge that you have received it, appreciate it and wallow in it. You won't be happy with more until you're happy with what you've got.